French system, key of A. 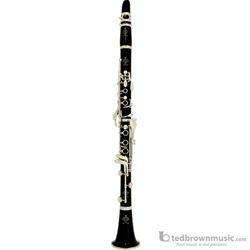 The legendary choice of professionals; .5765" bore; 65mm barrel; premium-quality grenadilla wood; 17-key, 6-ring nickel-plated keys; polycylindrical bore; undercut toneholes; adjustable thumb rest. Includes deluxe naugahyde-covered wood shell case with plush interior.